Gushers Gold is a Slot game with an “Oil Digging” theme where the drilling is dirty and the money shots come quick and fast. Game symbols have been fittingly chosen to suit the theme and include a Blonde beauty pageant winner, Flask, Cigar Box, Safety Helmet, Oil Barrel (paying out profitably when the oil fills the entire jackpot meter). 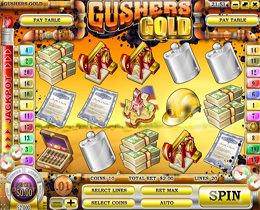 Gushers Gold is a great and lavish Slot to play with its astounding graphics and striking reel symbols. Its vibrant design, pleasant background music and extensive features allow players to relish the Slot and accumulate large winnings. Gushers Gold Slot has over 25 winning combinations and the betting ranges vary between $0.02 and $1.00 with a maximum bet of $50 per spin which is ideally suited for penny slot players.